MORGANTOWN, W.Va. (AP) — TCU’s Jamie Dixon and his team came to Morgantown needing to take care of business. The Horned Frogs failed, falling to West Virginia 104-96 in a triple-overtime thriller behind standout performances from Derek Culver and Jordan McCabe on Tuesday night to soften their bubble. The possible bursting of the Horned Frogs’ (18-10, 6-9 Big 12) NCAA Tournament bubble came with four seconds remaining in regulation, when West Virginia’s McCabe picked the pocket of TCU’s Desmond Bane with the game tied at 68-68. In overtime, West Virginia (11-17, 3-12) managed to stay deadlocked with TCU after Chase Harler nailed a jumper with 40 seconds remaining. Harler nabbed the rebound after Alex Robinson’s missed jumper, but the Mountaineers were unable to capitalize, sending the game to a second overtime. Similar story in the second overtime for the Mountaineers, Derek Culver put up the last shot and it came up just short. The dam finally broke for the Horned Frogs in the third overtime, when the Mountaineers took a 10-0 run midway through with three-pointers by Harler and Lamont West as well as a layup and a pair of free throws by Jermaine Haley. West Virginia played Tuesday’s game with only eight scholarship players. McCabe had his second straight game in double figures with a career-high 25 points and his first career double-double with 11 assists. Culver’s seventh double-double of the season came behind 22 points and 21 rebounds. Haley added 18 points and West chipped in 17. Kouat Noi had a double-double with 17 points and 10 rebounds for TCU. JD Miller led the scoring with 24 points and Bane added 17. For WVU head coach Bob Huggins, it’s the best he’s seen from his team in a long time. 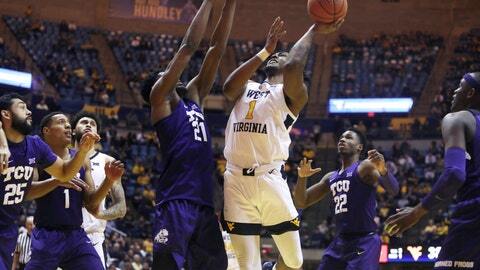 The Mountaineers outrebounded the Horned Frogs 52-45. TCU: With games against Big 12 title hopefuls Kansas State and Texas Tech remaining, the Horned Frogs’ loss in Morgantown could be the nail in the coffin if they can’t pull off either upset. West Virginia: While the Mountaineers have secured a losing season, breaking their five-game losing streak and standout performances by Culver and McCabe show a bright future for the program. The triple overtime thriller in Morgantown was a milestone for both teams for various reasons. For West Virginia, is marked their first triple overtime game since they lost at Dixon-led Pittsburgh, 98-95, on Feb. 12, 2010 and their first at home since a 90-86 win over Virginia Tech on Feb. 2, 1983. For the Horned Frogs, it’s their first triple overtime game since a 108-99 win over Texas State in Fort Worth on Nov. 24, 2009 and their first one on the road in program history. Many national analysts had TCU as an eight or 10 seed, with Kansas State and Texas Tech very much in the Big 12 title hunt. The Horned Frogs may need a run in the conference tournament to find itself on the happy side of Selection Sunday. TCU returns to Fort Worth to host No. 11 Texas Tech on Saturday. West Virginia will play at Oklahoma on Saturday.